In a recent press release Nikon introduced the INLINE XR Muzzleloading Riflescopes. This new line of scopes is specifically designed for muzzleloaders and for long-range hunting. It’s a scope that’s capable of supporting 300 yard shots. The breakthrough INLINE XR riflescope technology makes 300-yard shots a reality for hunters shooting today’s increasingly accurate inline muzzleloaders. Featuring the patented BDC 300 reticle, the ultra compact INLINE XR 3-9×40 offers five inches of constant eye relief throughout the magnification range, precision 1/4 –MOA adjustments, quick focus eyepiece and light transmission boosted up to 92% for dawn to dusk brightness. The INLINE XR’s BDC 300 reticle can be fully optimized to match the drop of virtually any sabot load with Spot On Ballistic Match Technology. You can check this and more information out on the official Nikon Hunting site when you click here. So, as you can see, it’s truly an impressive new line of scopes. As mentioned above, the Inline XR 3-9×40 offers a BDC 300 reticle which allows for long range hunting of 300 yards. 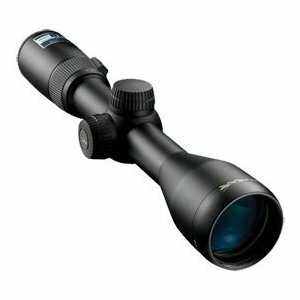 At this time the Nikon INLINE XR Rifle Scopes are available in matte, silver or Realtree APG finish. Nikon’s INLINE XR series of muzzleloading riflescopes are designed to give an edge to anyone wanting to extend their season – or their range – with a muzzleloader. The breakthrough INLINE XR riflescope technology makes 300-yard shots a reality for hunters shooting today’s increasingly accurate inline muzzleloaders. You can read the whole press release by clicking here. If you’re on the hunt for the best rifle scope then don’t forget to check out our rifle scope reviews. Good hunting!